By 1981, a new form of dance music was developing. This music, made using electronics, is a style of popular music commonly played in dance music nightclubs, radio stations, shows and raves. During its gradual decline in the late 1970s, disco became influenced by computerization (the first notable fully synthesized disco hit was "I Feel Love" by Giorgio Moroder and Pete Bellotte with lyrics by Donna Summer). 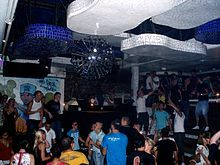 Looping, sampling and segueing as found in disco continued to be used as creative techniques within trance music, techno music and especially house music. In 1970, the television show Soul Train premiered featuring famous soul artists who would play or lipsync their hits while the audience danced along. By the mid-1970s disco had become one of the main genres featured. In 1974, Billboard added a Disco Action chart of top hits to its other charts (see List of Billboard number one dance club play songs). Disco was characterized by the use of real orchestral instruments, such as strings, which had largely been abandoned during the 1950s because of rock music. In contrast to the 1920s, however, the use of live orchestras in night clubs was extremely rare due to its expense. Disc jockeys (commonly known as DJs) played recorded music at these new clubs. The disco craze reached its peak in the late 1970s when the word "disco" became synonymous with "dance music" and nightclubs were referred to as "discos". The Dance/Mix Show Airplay chart tracks the most popular tracks played by radio stations using a "dance music" format. Modern dance music is typically a core component of the rhythmic adult contemporary and rhythmic contemporary formats, and an occasional component of the contemporary hit radio format in the case of dance songs which chart.